Many of us admire the beauty and durability of brick and stone on our homes. In my opinion, nothing compares in beauty, elegance and durability of a stone or brick exterior. And while a masonry exterior is considered low maintenance it is definitely not no-maintenance. Certain areas of our masonry homes are susceptible to wear from the elements. Brick or Stone chimneys, mailboxes, steps and walkways are constantly exposed to the elements and require preventative maintenance in order to ensure their lasting beauty. Being unaware of the need for, or neglecting this maintenance can lead to costly repairs in the future. We at Alexander Masonry, Inc. receive a barrage of calls each Spring regarding chipping, cracking, and spalling brick and stone. Why do the majority of the calls come in the Spring? As the weather starts to warm, homeowners venture outside and begin to inspect the outside of their homes. Often the homeowner notices that the brick on their chimney is starting to “pop” off. This damage is caused primarily in the winter by the freeze thaw cycle. Moisture enters the masonry structure in the form of rain, snow, or, in the case of a fireplace, condensation from the fire. This moisture freezes and expands when the temperature falls. It thaws on warm or sunny days and then freezes again at night or when the temperature falls again. This cycle keeps the moisture trapped in the masonry structure and the expansion of the frozen water causes the brick or stone to crack and the faces to “pop” off (spalling). Once this type of damage starts, it accelerates because the cracks and spalling allow even more moisture to enter the structure. What should a homeowner do to protect themselves from this problem? Allow a qualified professional to apply a siloxane repellant to your brick or stone chimneys, mailboxes, steps or walkway (I also recommend waterproofing your brick or stone window sills for soft brick). Siloxane is classified as a water repellant not sealant. It allows masonry structures to “breathe.” Other sealants trap moisture in and can actually exacerbate the problem. Siloxane will not darken or discolor masonry walls. It is also long lasting. (It offers about five years of protection) We have been using this product for over 12 years with excellent results. Water proofing your masonry structure is not overly expensive (most chimneys for example can be protected for under $300.00) and is well worth the avoidance of future repairs. 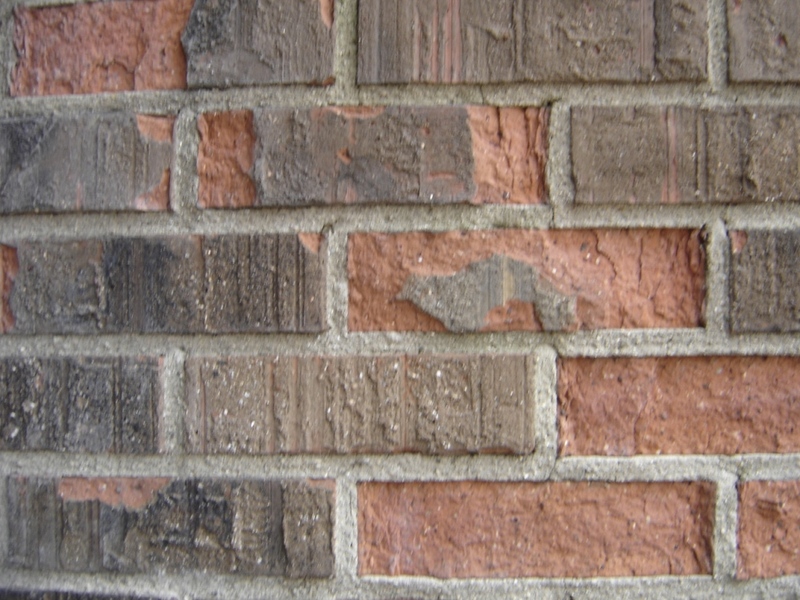 What should I do if I already have some spalling or cracking of my masonry? Don’t let the problem get worse by waiting. Sometimes all that is needed is for a few bricks to be patched or replaced, caulking of cracks, and water proofing. Unfortunately, if the spalling and cracking continues, eventually, the structure will have to be tore down and rebuilt. Call a trusted professional and obtain references to ensure that you get the most value for your dollar.